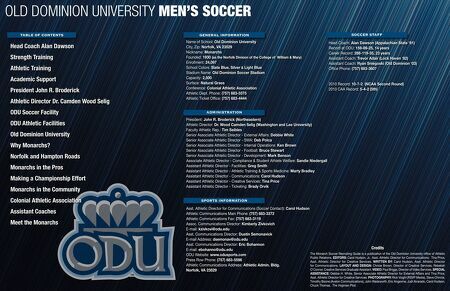 OLD DOMINION UNIVERSITY MEN'S SOCCER TABLE OF CONTENTS Head Coach Alan Dawson Strength Training Athletic Training Academic Support President John R. Broderick Athletic Director Dr. Camden Wood Selig ODU Soccer Facility ODU Athletic Facilities Old Dominion University Why Monarchs? Norfolk and Hampton Roads Monarchs in the Pros Making a Championship Effort Monarchs in the Community Colonial Athletic Association Assistant Coaches Meet the Monarchs GENERAL INFORMATION Name of School: Old Dominion University City, Zip: Norfolk, VA 23529 Nickname: Monarchs Founded: 1930 (as the Norfolk Division of the College of William & Mary) Enrollment: 24,097 School Colors: Slate Blue, Silver & Light Blue Stadium Name: Old Dominion Soccer Stadium Capacity: 2,500 Surface: Natural Grass Conference: Colonial Athletic Association Athletic Dept. Phone: (757) 683-3375 Athletic Ticket Office: (757) 683-4444 ADMINISTRATION President: John R. Broderick (Northeastern) Athletic Director: Dr. Wood Camden Selig (Washington and Lee University) Faculty Athletic Rep.: Tim Seibles Senior Associate Athletic Director - External Affairs: Debbie White Senior Associate Athletic Director - SWA: Deb Polca Senior Associate Athletic Director - Internal Operations: Ken Brown Senior Associate Athletic Director - Football: Bruce Stewart Senior Associate Athletic Director - Development: Mark Benson Associate Athletic Director - Compliance & Student Athlete Welfare: Sandie Niedergall Assistant Athletic Director - Facilities: Greg Smith Assistant Athletic Director - Athletic Training & Sports Medicine: Marty Bradley Assistant Athletic Director - Communications: Carol Hudson Assistant Athletic Director - Creative Services: Tina Price Assistant Athletic Director - Ticketing: Brady Orvik SPORTS INFORMATION Asst. Athletic Director for Communications (Soccer Contact): Carol Hudson Athletic Communications Main Phone: (757) 683-3372 Athletic Communications Fax: (757) 683-3119 Assoc. Communications Director: Kimberly Zivkovich E-mail: kzivkovi@odu.edu Asst. Communications Director: Dustin Semonavick E-mail Address: dsemonav@odu.edu Asst. Communications Director: Eric Bohannon E-mail: ebohanno@odu.edu ODU Website: www.odusports.com Press Row Phone: (757) 683-5596 Athletic Communications Address: Athletic Admin. Bldg. Norfolk, VA 23529 SOCCER STAFF Head Coach: Alan Dawson (Appalachian State '81) Record at ODU: 159-89-25, 14 years Career Record: 288-119-35, 23 years Assistant Coach: Trevor Adair (Lock Haven '82) Assistant Coach: Ryan Sniegoski (Old Dominion '03) Office Phone: (757) 683-3607 2010 Record: 10-7-2 (NCAA Second Round) 2010 CAA Record: 5-4-2 (5th) Credits The Monarch Soccer Recruiting Guide is a publication of the Old Dominion University office of Athletic Public Relations. EDITORS: Carol Hudson, Jr., Asst. Athletic Director for Communications; Tina Price, Asst. Athletic Director for Creative Services. WRITTEN BY: Carol Hudson, Asst. Athletic Director for Communications. LAYOUT AND DESIGN: Chrisie Brown, Director of Creative Services; Rebekah O'Connor, Creative Services Graduate Assistant. VIDEO: Paul Briggs, Director of Video Services. SPECIAL ASSISTANCE: Debbie H. White, Senior Associate Athletic Director for External Affairs and Tina Price, Asst. Athletic Director for Creative Services. PHOTOGRAPHY: Rick Voight (RSVP Media), Steve Chinnis, Timothy Boone (Avalon Communications), John Wadsworth, Eric Angevine, Judi Alvarado, Carol Hudson, Chuck Thomas, The Virginian Pilot.